It is often a hassle to gather content from a group of users and find what of it may be of interest. Videos and images may be too large to send by mail and you need to use several different services for your live videos, VOD, editing, transcoding to desired formats, handling images, publishing, storage etc. With our content manager all content is gathered in one place and accessible from anywhere. You may filter and search through the content to find what you are looking for in a jiffy. 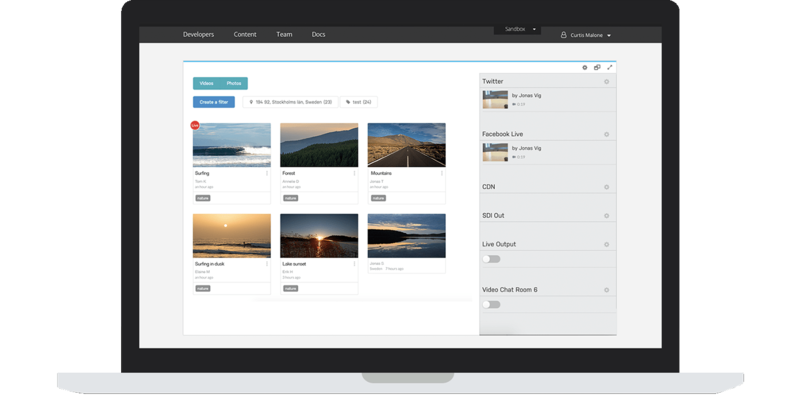 Here you may preview and edit videos directly before publishing or downloading them. While previewing live videos you may communicate directly with the broadcaster by typing chat messages or giving them a voice call.